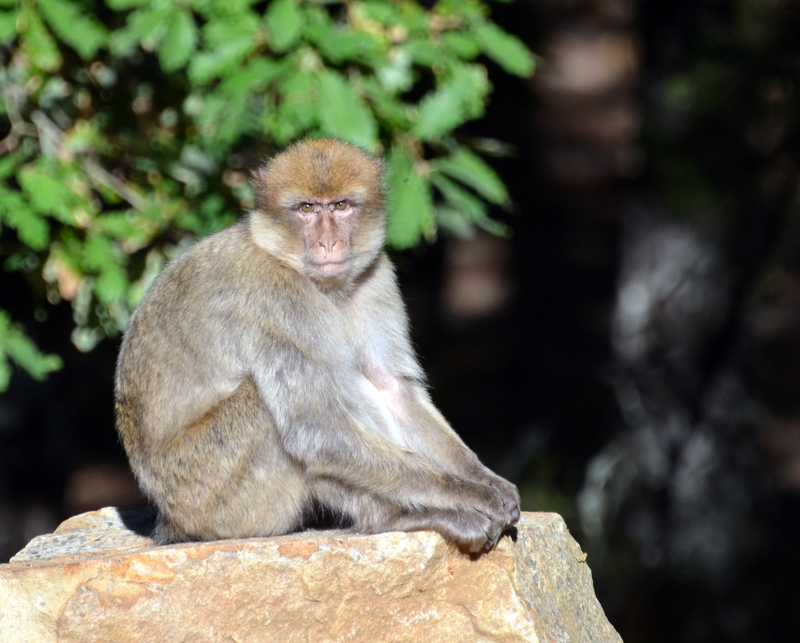 When we are in Bouhachem, we wake up early to catch sight of the macaques. We drag ourselves out from thick woollen blankets and blink into the first sharp rays of sun, dogs bouncing around our feet as we pick across the dusty courtyard to breakfast. The mountains in front of us fade from black to charcoal grey as the sun climbs up from behind them, and the birds compete to greet the day the loudest. In the car, we fight the lullaby of bumping as the wheels meet years of rain washed paths, fixing sleep-soaked eyes on the patient army of oaks that line the slopes above us and the canyons below. The first glimpse is a flash of sand coloured life against the grey of the road ahead, and we fall into a silence tense with excitement as the car slows to a halt. The first glimpse is soon two and then three, as fallen oak leaves spring suddenly to life, becoming monkeys as they dart out in front of us. Some run with focused speed, only brief glances acknowledging our stares. Others stop, wise faces looking back over characteristic round shoulders as they contemplate their next move. We lean out of our windows as far as we dare, squinting through binoculars and trying to make our cameras see this scene as we do – to love it just as much. In a small, spreading pool of water to our right, last year’s babies wet their feet and hands, carefully scooping tiny morsels to try, furtively and with sideways looks, between splashing bouts of play. They bounce off the ground with springs for legs, almost as if the carpet of leaves is tossing them into the air, joining their game. Others hang from trees above, testing branches only just thick enough to take their weight. In slow motion, they get closer to the ground, twisting and swinging and suspended for long moments, then suddenly letting go, as if someone has pressed play again. They scatter, some to the water and some, away from us, into the shadows under the trees. In the distance, careful mothers hold on to tiny black-haired babies, slender fingers cradling wobbly heads and supporting fragile backs, not yet ready to let go. As we watch, suppressing delighted sound, one young adult creeps closer, curiosity overcoming natural fear. Contemplative, he takes his time to find a seat where he can watch us watching him, walking for a while among sun-splattered rocks before finally choosing a place. In the warm light, he is brown and sandy and silver, and his eyes are clear and calm. He holds his feet in his hands – unmistakably, endearingly, a macaque – and he sits. We hold on to our excitement, gripping our binoculars and cameras and notebooks tighter as we lower them to our laps, look quickly, happily, at each other, and look back at him. When he is ready, he turns to leave; he is just right, here in the wild, and we are happy to see him go. I am currently working in Morocco with Barbary Macaque Awareness and Conservation, without whom I wouldn’t have the privilege of seeing Barbary macaques in the wild. To support our work, please look at our current initiatives on our social media channels, or contact info@barbarymacaque.org.